PHP-Aquarium save you time by simple one-click-operation! 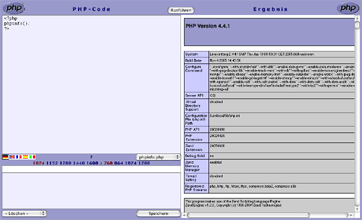 Write PHP-code on the left, click on "Execute" and view the effect on the right side. PHP-Aquarium is a simple but fast development environment for PHP. Only one click is necessary to see the effect of your code. With this fast one-click-feedback Aquarium is suited for beginners in PHP as well as for professionals for fast-testing the behaviour of certain functions. There is no need of saving the PHP file, uploading it to the PHP server, displaying it in a browser window - instead it is just one click! You don't have to install a local Apache or a PHP server demon. Move the downloaded files into a folder onto your PHP server. You should protect your folder against unauthorized access with a .htaccess file because Aquariums PHP allows total control over the server! Type your php-coding in the upper left field with the tags <?php and ?>. The effect is shown in the right field after clicking "Execute". Just choose one out of five by clicking on the appropriate country sign. Language and resolution are stored in cookies for one year. Width and height can be chosen separately to match your screen or need. To save little code portions for future usage fill in a title and the code in the two left fields beneath the resolution controls. Then click on "Save as". Use the pulldown menue "Examples" to display a portion in the right field. Copy parts or the whole example in the right and insert it in your code at the left. For deleting a saved example use "Delete". For confirmation click on the link "Delete?" too. I would appreciate your suggestions for improvement and translation of this introduction into other languages.